Extensions are X and Pro specific plugins available for download for all customers with a validated purchase of X or Pro. You can easily download and manage all of your Extensions directly from the WordPress admin area under X > Validation or Pro > Validation. This article covers documentation for the Snippet extension and goes into detail on certain features where needed. After installing and activating Snippet. You'll find its settings page underneath the X menu item. This menu item would be called Pro if Pro was in use rather than X. The purpose of the welcome screen is just to explain about some of the features of the plugin and what needs to be set up. From there you can navigate to any of the other settings. The first of which is Global Settings. There are a lot of options on this page, so let's explore each one and what it means for your website. The first option is for the output, the first selection being either setting your Schema markup to a Website, Organization or both. This affects how your site displays in search results. If you're a blogger, for example, you'd just check the option for Website However if you run a Club, a Business, or a School and want to enter in your Organizations details you'd check the Organization option. And of course, you can always check both if both settings apply to you, which if you run an Organization and have a website for that Organization you'll want to check both options. The next checkboxes are all directly related to if you want to output Schema on those post types. The Global Default Schema is a default Schema type that will be used if no specific Schema Type is set for that post type. Under the Global Default Schema are options to set the Schema type per post type or disable it completely for those post types. You can enable and select the Schema type or disable it completely by clicking in the drop-down box. Once you're happy with everything set on this tab, click on Update to save your changes. On this tab, settings are split up by Required settings and Optional settings. The first settings are for the website URL which is required. This option is the URL you want to show in search results. It defaults to the WordPress address URL set in wp-admin > settings > general. The next settings are all optional and don't need to be filled in. Site Alternate Name - This is the alternate name your website is known by and can enhance searching and search results if your website is commonly referred to by a name that isn't the actual website name. Enable Site Link Search Box - The site link search box allows your users to search on your website without actually leaving the original search results. To learn more about this option, Google has a great document here. The next tab is Organization. 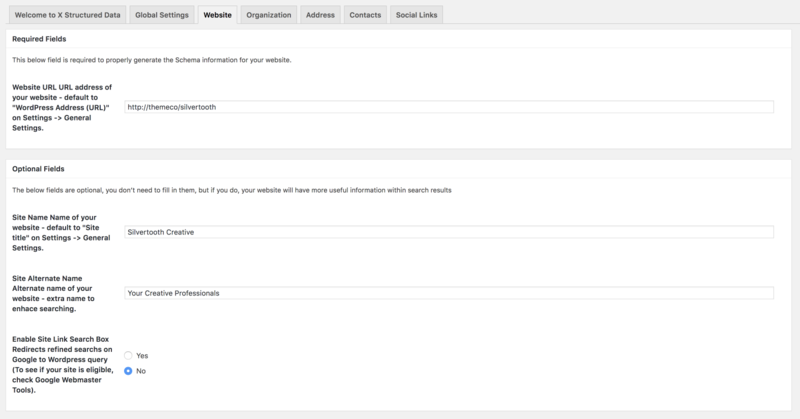 These settings all relate directly to how your Organization will display in search results for your website. The next lot of fields are all entirely optional. 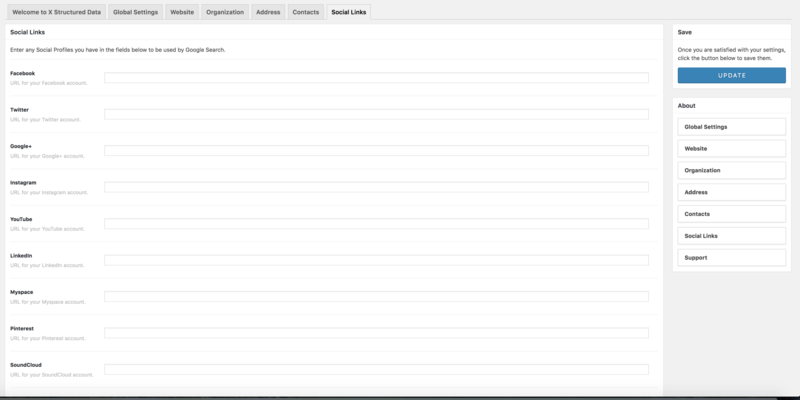 If you fill them in more information about your Organization will be available in search results. Logo URL - This is the URL for an image/logo for your Organization that you want to display in search results. Additional Types - You can add additional types to your Schema markup as extensions using this option. Description - This is a description of your Organization/business. Hours Of Operation - These are the hours your Organization is open and available to the public. The next tab is the address tab. 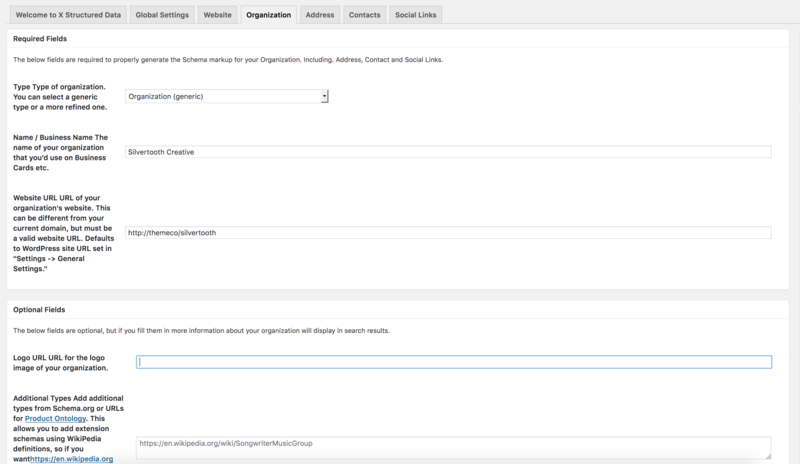 This is the address of your Organization and will be displayed in search results. You can also enter the Geographical Coordinates. Make sure to fill in all Address information on this tab, or the Schema markup won't be properly generated for your website. The next tab is for contacts. These are contact details of your Organization, and you can add multiple contacts for example for different departments such as Support, Sales, etc. Once you've entered your contact information in, scroll to the bottom of the page and click on Update contact. The last tab is Social Links These social links will be used within your Google Search results. Once you're happy with everything click on Update and everything will be saved. Help me to figure out, what is Main entity of page on your snippet plugin?